It is truly an honor to feature Eliana Rivero’s piece as our October post as we move into autumn, a season of change. Eliana is an intellectual pioneer in the field of Cuban literature. Living in Arizona, far from the Miami exile enclave, she had to rethink what it meant to be Cuban. She was one of the first scholars to study the writings of Chicana, U.S. Puerto Rican, and Cuban American women in a comparative manner, to see them as Latinas writing about a shared history. Twenty years ago, in the anthology, Bridges to Cuba/Puentes a Cuba, she called herself a “fronterisleña,” a border islander, referring to the sand of the desert and the beach, the two landscapes where she has lived. Now in her beautiful and tender piece for our blog, she returns to her family home in Pinar del Río, carrying a song beloved by her parents, bringing their memories to rest under the royal palm trees. I have always thought that my father was rightly inspired to sing the song “Amapola” to my mother when he began courting her. And when I was born, I also became the pretty little poppy in the lyrics. Picture this: San Cristóbal, Province of Pinar del Río, Cuba, circa 1929. My mother is sixteen years old; she dresses like Theda Bara and Myrna Lloyd, the young women in the Hollywood movies that are starting to be shown in Cuba, and her hair is cut in a bob. My father, age twenty, lives nearby; his family has just moved to town from a country farm, and he’s working at his first job selling hats in a clothing store. They connect through neighbors. He comes to visit, sits on the porch talking to my mother, both on rocking chairs, but under the watch of my grandmother´s vigilant eye. My maternal grandfather, Abuelo Tonito, has a movie theater (Cine Capetillo), where my grandmother played the pianola to accompany Hollywood silent releases. My father would joke that as he was courting my mother he had to pay for a ticket. No concessions there. These memories are etched in my memory and heart like a Rembrandt with a chiaroscuro quality that makes them flow like a current—not in an Amsterdam canal, but in the San Cristóbal river of my parents´ youth. 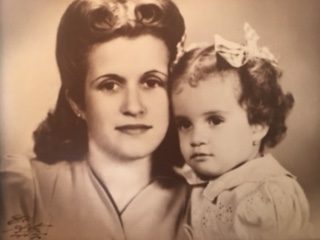 Havana photo from 1944 with María Antonia Rivero Hernández and Eliana Suárez Rivero, mother and daughter. I have returned to Cuba several times over the decades. When people on the island listen to my stories of remembrance, they unfailingly marvel at how I am able to recall all this traditional Cuban music, after more than 55 years away from the homeland where it was created. My friends even laugh when I mix lyrics from contemporary reguetón/reggaeton numbers into our conversations (I do this to show them I am not hopelessly stuck in the past, of course). But it is “Amapola” that continues to haunt me. Once I published a piece about my childhood that was titled “La niña de los conejos” (“The Girl with Rabbits,” the pets I had as a child), but I might as well have called it “Amapolas y conejos” for the memories of my parents it brought back to life: our Sunday outings to gather piñón tree leaves to feed my pets, my dad driving our green Studebaker and singing “Amapola,” one of the most popular songs in those times. To this day, I’m not sure if what fascinates and transports me is the tune resounding in my head (sometimes in the voice of the great tenors and others in my father´s not-quite-as-great rendition), or the images that it evokes of a Cuban family´s love for each other, persisting beyond absence and separation, and even death. I hear those songs from the 20s and the 30s and I am transported in time, to their youth and their happiness and their smiling faces, even though they have been gone so long now, even though their only return to Cuba was in the form of ashes. I was surprised at how calm I felt at that moment, with a sense of completion. I took photographs of the place to commemorate their return: my parents left Cuba on September 30th, 1970, and part of their ashes returned to a final union with Cuban soil on January 8th, 2016, on their beloved granddaughter’s birthday. “Rest in peace, mami y papi. You are home again,” I whispered. My mind was quiet⏤the music had left me completely⏤as I walked the gardens, but later, as I wrote these words in silence, I wept. All those years of missing the land and its people, all that nostalgia and sadness and sorrow for the loss of home and country, all the love contained in their “Amapola”: all of it has finally ended for them. And I hope it will end for me also, although I am certain it will not be today. Eliana Rivero is Professor Emerita in the Department of Spanish and Portuguese and the Center for Latin American Studies at the University of Arizona. She was born and raised in Cuba, and immigrated to Florida in 1961, where she attended the University of Miami and received a PhD in Hispanic Letters. She is a prolific literary scholar in the areas of Latino and Latin American Literature, including Cuban American studies. Her most recent scholarship mixes personal reflection with cultural analysis, and her creative writing has strong autobiographical overtones. Her last publications include the book Discursos desde la diáspora (Valencia, 2005) and a childhood memoir in Revista Vigía (2015), besides several articles on topics ranging from Latin American poetry to Mexican colonial nuns. She is at work on her memoir Cuban Again.